The original long-lasting lip colour is the perfect way to make a lasting impression. Max Factor Lipfinity Lasting Lip Tint Pen 2.5g(full size). NEW AND SEALED. 2 x Max Factor Lipfinity Lasting Lip Tint Pens 2.5g each(full size). NEW AND SEALED. 100% AUTHENTIC or YOUR MONEY BACK. You will receive Foxy Amber and Subtle Coral. 4 x Max Factor Lipfinity Lasting Lip Tint Pen 2.5g(full size). NEW AND SEALED. 100% AUTHENTIC or YOUR MONEY BACK. Max Factor Lipfinity Lasting Lip Tint gives you a flash of colour that doesn't transfer when you eat, drink or kiss and feels surprisingly lightweight. Its nifty pen applicator is perfect for precise application and you can build up the colour as much as you dare or keep it light and simple. MAX FACTOR LIPFINITY LASTING LIP TINT - DIFFERENT SHADES AVAILABLE - BRAND NEW! 4 out of 5 stars - MAX FACTOR LIPFINITY LASTING LIP TINT - DIFFERENT SHADES AVAILABLE - BRAND NEW! 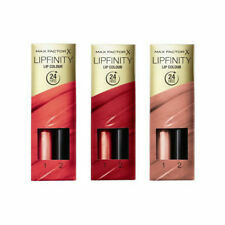 2 product ratings2 product ratings - MAX FACTOR LIPFINITY LASTING LIP TINT - DIFFERENT SHADES AVAILABLE - BRAND NEW! Max Factor Lipfinity Lasting Lip Stain. MAX FACTOR Lipfinity Lasting Lip Tint - MYSTIC MAUVE. Condition is New. Max Factor Lipfinity Lip Tint (4ml) gives your lips a vibrant splash of colour using its lightweight, water-based formula. By permeating and infusing with your lips, this tint does not transfer thus leaving your with comfortable and kissable lips! With a felt-tip pen style applicator, using Lip Finity Lip Tint couldn't be easier and accurate application is a doddle as you can trace your lips contours with the nib. new max factor lipfinity lasting lip tint shade 03. Condition is New and sealed.Dispatched with Royal Mail. This is MaxFactor Lipfinity Lasting Lip Tint. new and sealed. Max Factor - Lipfinity Lasting Lip Tint - Colour 03. 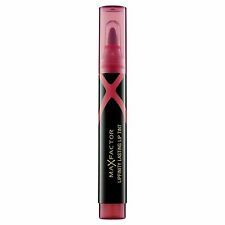 Lip tint pen by Max Factor in stunning pink shade. We do our best to process as quickly as possible. Does not apply. Long lasting Lip Colour- smooth finish with lustrous sheen. The original long-lasting lip colour is the perfect way to make a lasting impression. A smooth finish with a lustrous sheen. The original long-lasting lip colour is the perfect way to make a lasting impression. Daring colour that lasts for up to 24 hours.